This Beautiful andalucian style villa, finished in 2008 is now available for year round holiday rental. 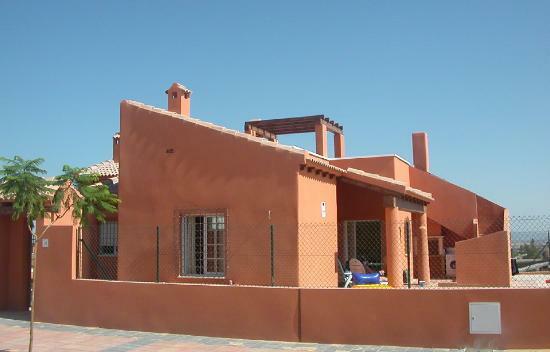 Set in the Spa area of Fortuna, Murcia, this is an ideal summer and off-season let. Nestled between the hills of Fortuna, and the hot Spa baths of Los Baños this 3 bedroom villa has been especially built to cater for visitors with limited mobility and accommodates 6-8 people. All the accommodation is on one level with all doors and entrances wide enough to accommodate wheelchair users. It boasts 3 bath/shower rooms, including a wet room and has a covered outdoor patio and large rooftop solarium. There is a built-in Barbeque outside and off road parking large enough to accommodate a large people carrier. Please click the palm trees on the left to browse the site, and feel free to contact us for more information.